So, when I said that my mum really liked Nigella's crab and avocado wraps, I didn't realise quite how much she liked them. We had them for dinner on Thursday night, and 2 nights later, on Saturday, she requested that I make them again. You see, we were going out to see my brother's girlfriend play violin (Go Su, go!) that night, and Mum thought they would make a nice light supper after we returned. Too right. That afternoon, I remade the crab and avocado wraps, substituting the crab with omega-3-filled and low-cholesterol tuna, and whipped up the chicken ceaser cornets (that's "cones" for us Antipodean readers) from the On the Run chapter. The ceasar cornets are made of tortillas, rolled into a cone shape, and filled with a mixture of cooked chicken meat, mayonnaise, iceberg lettuce parmesan cheese and worcesteshire sauce. We stashed the wraps and cornets in the fridge, ready to be devoured after the concert. The wraps, as expected, were great again. But we were really, super-duper impressed with the cornets! Verrry tasty. The only problem was the excess of tortilla. When wrapped up as a cornet, you end up with 3 layers of tortilla on the bottom (see photo above), which proved to be a bit too much bread. I found that most people ripped off the excess tortilla and left it on their plates. Perhaps a more traditional wrapping method would be better. Or just regular pita pockets. Either way, they were still delicious! Your site never fails to make my mouth water, and many of Nigella's recipes tempt me much more in your photographs than they do in her books! At the risk of being a damp squib, though, if you used tinned tuna it doesn't actually contain Omega 3 oil (no more than white fish, anyway - the oil is removed in the canning process). Of course, if you used fresh tuna then just ignore me. 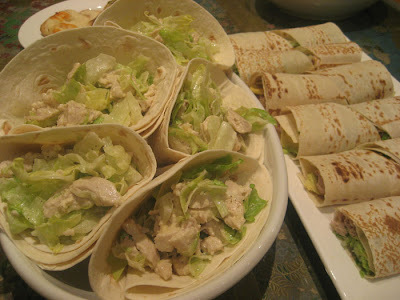 hey cuz, can you make these crabby wraps next time we have a piku-niku?! they look DELICIOUS!! !